Call 1.808.239.5711 or email us to reserve this suite. Featuring stunning views of Kaneohe Bay, this family suite has a separate living room and two bedrooms furnished with a King bed in each. Room size is approximately 700 square feet and can comfortably accommodate up to four adults. Limited availability. This spacious suite is furnished with a large private lanai patio fronting a waterway, separate living room and two bedrooms with a King sized bed in one bedroom and two twin beds in the other. Our Kahouna Suite is approximately 600 square feet large and can accommodate up to four adults comfortably – an ideal choice for families. “Hale’ Opua” means house in the clouds in Hawaiian. 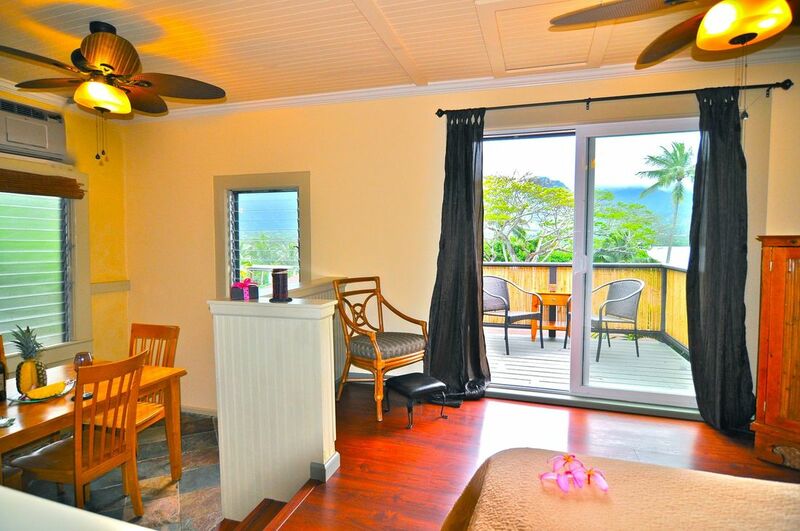 This oversized two-bedroom suite features unparalleled views of Kaneohe Bay and is furnished with a large private waterfront lanai patio, separate living room and two bedrooms with a King sized bed in each bedroom. Our Hale’ Opua Suite is approximately 1,250 square feet large and can accommodate up to four adults.